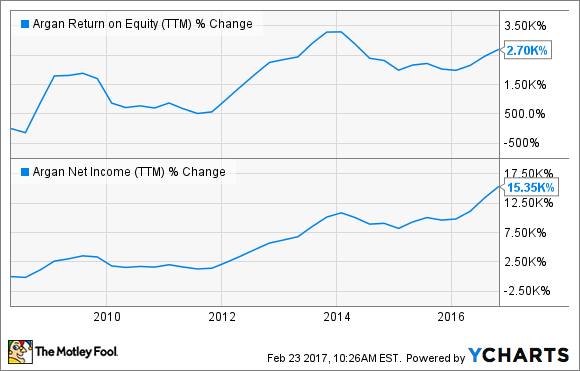 These three growth stocks could outperform even Nvidia's jaw-dropping performance. Over the past five years, shares of the visual computing company Nvidia Corporation (NASDAQ:NVDA) have blasted northward, gaining a staggering 575%. While this type of return on capital is exceedingly rare in the stock market, there are a number of companies working on disruptive new technologies and products that could eventually produce similar -- or perhaps even better -- growth trajectories at the end of the day. Our contributors, for example, think that Cara Therapeutics (NASDAQ:CARA), Argan Inc. (NYSE:AGX), and Sony (NYSE:SNE)all have what it takes to outperform Nvidia's impressive track record. Read on to find out why. 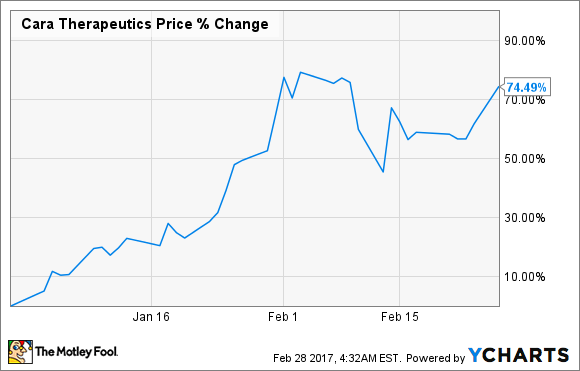 George Budwell (Cara Therapeutics): Even though 2017 is only about two months old, shares of the small-cap biotech are already up a whopping 74%. The crazy part is that literally nothing has happened to spark this jaw-dropping rally -- at least not yet. Having said that, the market apparently is starting to take notice of the commercial potential of Cara's experimental pain med CR845, which is on track to produce a pivotal-stage readout in the acute post-operative pain setting in the first half of the year. If successful, CR845 would be one step closer toward displacing standard opioids like morphine and fentanyl in acute pain situations. Unless you've been living under a rock over the past decade, you're probably well aware that the U.S. is experiencing a severe opioid epidemic that's reportedly affecting over 20 million Americans at present. The point is that the highly addictive nature of opioids -- combined with their severe side effects, which can even be life-threatening -- is driving a rigorous search for alternative pain relievers within the pharmaceutical industry. And that's where Cara's CR845 comes into the story. Unlike morphine, which targets the mu-opioid receptor, CR845 is a kappa opioid receptor agonist. As such, it should theoretically provide comparable levels of pain relief but without the problematic side effects. And if this hypothesis is borne out by the clinical data, this drug could easily transform into a megablockbuster product given that over 60 million patients per year in the U.S. undergo procedures that require prescription pain meds. The flip side of the coin is that CR845 is far from the first experimental pain med to target this huge unmet medical need. This need still exists because no single drug candidate has produced an overall clinical profile (efficacy plus safety) that's superior to morphine. Summing up, Cara's stock could probably outperform even Nvidia's monstrous track record if CR845 does strike gold in its ongoing late-stage trial, but this ideal scenario is far from a sure thing given that replacing morphine has proven to be a tough nut to crack. Neha Chamaria (Argan Inc.): Have you ever heard of Argan, an engineering, procurement and construction services company that's worth about $1.1 billion today? Well, if you'd bought shares of Argan this same day back in 2011 and forgot all about it, you'd be holding an 8-bagger today. That beats NVIDIA's returns during the period. Past performance doesn't guarantee future returns, but I believe Argan remains a potential multibagger even at current prices. Argan may not belong to a fast-growing industry like NVIDIA, but its mind-boggling track record of profits and return on equity, a pristine balance sheet, and strong foothold in an essential industry count among the key qualities of a multibagger stock. nearly 83% of Argan's revenues, has installed more than 14,000 megawatts of capacity, including 435 MW of wind, 12 MW of solar, and 370 million gallons per year of alternative fuels capacity. With the power industry gradually shifting from coal to natural gas and renewable energy gaining momentum, Argan's project bookings could soar in coming years. There's no reason why its profits and stock price shouldn't follow suit. In fact, Argan appears to have already stepped on the gas, with its backlog hitting record highs of $1.2 billion as of Dec. 31, 2016, growing at a compounded average clip of 23% since 2012. That's incredible, and reflects the growth potential in Argan's business. What's more, Argan is a debt-free company, which makes its average five-year ROE of 20% look all the more solid. Argan is neither as popular nor as large as NVIDIA, but such little-known rapidly growing companies often turn out to be megawinners for shareholders in the long run. Rich Smith (Sony): They used to make TVs, right? And, like, the Walkman? And this is a stock that's supposed to soar more than NVIDIA? Well yes, it is. Now let me tell you why. Sony is more than just televisions. It's also one of the biggest names in gaming -- a business that generated $13.8 billion in sales for Sony last year, and was its biggest revenue producer (even bigger than TVs). According to data from Statista.com, Sony has definitively won the console wars against Microsoft (NASDAQ:MSFT) (and Nintendo for that matter). Last year, Sony unloaded 12.3 million units of the Playstation 4 -- more than twice the 5.8 million Xbox Ones that Microsoft moved, and nine times Nintendo's 1.4 million sales of the Wii U. This opens up a huge lead for Sony over Microsoft and Nintendo for follow-on sales of games and accessories -- and virtual reality headsets, which may become the next big thing for gamers. Yet despite this success, Sony stock remains remarkably cheap, giving investors more opportunity to profit as it runs up. Currently, Sony boasts a market capitalization of only $39.1 billion (and an enterprise value that's even cheaper -- Sony has $4.8 billion more cash than debt on its balance sheet). And while the company technically has no "profits" (as GAAP accounts for such things), it's not quite correct to call Sony "unprofitable." In fact, Sony generated positive free cash flow of $3.1 billion last year, which, when weighed against the company's market cap, yields a price-to-free cash flow ratio of only 12.6. Analysts who follow the stock believe Sony will grow its profits at about 18% annually over the next five years, which results in a price-to-free cash flow-to-growth ratio of 0.7 -- cheap by any measure. And again, this is all before accounting for the cash already on its balance sheet, which makes the stock even cheaper. For my money, despite the famous name, Sony stock remains a gem of an investment, and one that could soar more than NVIDIA once investors recognize its true worth.